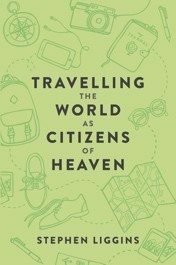 In this day and age, where travelling on a plane is almost as simple as travelling on a train, where travel for many is the norm and now far more financially accessible than it used to be, Stephen Liggins new book, Travelling the World as Citizens of Heaven, comes as a welcome voice into the Christian thought world. Liggins writes the book for those looking to travel abroad, for any period of time that might span a few weeks to a few months; for any number of reasons ranging from leisure to visiting friends to work to short term ministry. Initially, I thought this book would be best for youth or young adults. Aren’t they the ones who are most likely to travel in general, and the ones who are most likely to use travel as an investigation of worldliness in all its many, colourful forms? Certainly, it holds great value for these audiences—a youth group perhaps, or for those considering travel within their gap year. But on reflection, I think that no matter how old the believer is, travel is more often used for one’s own purposes than for God’s. More often an idol than enjoyed as a gift or used as an opportunity to serve. So, this book is for any Christian person of any age who is wanting to travel abroad (or indeed more locally) and who is wanting to use their whole life (including travel) for kingdom purposes. The book is very easy to read, not limiting its use only to the highly educated reader. Liggins does not use complicated language but spells out his points very simply. It is very enjoyable to read too, for each point Liggins makes is illustrated with one of his own personal travel experiences. Other than his careful biblical interpretation and exposition, it is this experience that gives his book authority on this subject. Liggins is quite obviously a student of God’s Word and God’s world. Liggins’ motivation for writing is borne out of concern for Christians who travel, having seen some “whose faith has been shipwrecked on foreign shores.” His hope in writing is that for all Christians who travel, the experience “will be a spiritual plus rather than a spiritual minus.” In this book Liggins provides a great tool to enable just that. The structure to the book is very simple: an introduction, seven chapters of equal length, and a conclusion. At the end of each chapter, he gives a “Checklist”—dot points summarising the chapter, which is helpful and succinct; indeed if the reader was short on time they could skim these to reap the main points of wisdom in the book. Chapter 1 encourages the reader who is on holiday from home, not to take a holiday from God. This may sound obvious, but most of us do just that. When on student exchange in France at 18 years old as a new Christian, I did have my Bible, but it rarely came out from its home under my bed for the 4 months I was away. Church was too hard, prayer was reserved for emergencies, and as a consequence my relationship with God stagnated during that time. Liggins provides the tools every Christian, new or old, needs to keep their relationship with God thriving whilst away. Tim Keller in The Way of Wisdom says, “The more we take God out of the picture, the more we will feel things are meaningless.” Travelling this creation brings many opportunities for idolatry of creation. But this idolatry, in turn, will lead to a sense of meaninglessness. It is for this reason that I found Chapter 3, “Travelling God’s World” to be very refreshing. In it Liggins reveals what our response to creation (and all its beauty) should be—worship of the Lord our Maker (Psalm 95). Don’t let travel and any experience of creation distract you from God; let it lead you to him. Chapters 3 and 4 are about connecting with Christians and non-Christians respectively. In this way Liggins covers all people to be encountered; and thus here provides a great framework for intentionally seeking God’s glory in any personal interaction whilst away. There were two suggestions I found helpful in Chapter 3. First, Liggins suggests doing some research on behalf of a travelling friend or family member into Christians/churches they could visit whilst away—a practical way of caring for the spiritual health of our travelling brothers and sisters. Secondly, he mentions that at times there may be great opportunity to continue supporting a country you have visited (e.g. through prayer or financial partnership). What a great thought to keep in mind as we well-resourced-Christians travel the world to less well-resourced places. Chapter 6 implores the reader to wisely “Know Thyself” in considering decisions regarding whether to travel solo or in company, pace of travel, accommodation types and how to approach health issues. And finally, Chapter 7 covers the “Why Travel?” question. He poses three very useful questions to the potential Christian traveller: What are your reasons for travel? Will this travel be a good use of the resources God has given you (in particular your time and money)? And how might this travel impact your key relationships? Liggins gives two passages to underpin all thinking to these questions: Matthew 6:33, “But seek first His Kingdom…”, and Matthew 22:37-40, “Love the Lord your God with all your heart, and with all your soul, and with all your mind….Love your neighbour as yourself…”. These passages underpin all of our thinking and decision making as Christians, including, as here, decisions about travel. So what place does this book have in our lives today? I think most of us tend to think of travel as an overseas holiday. Some of us may also consider short term mission. We might pray about accommodation details, or health and travel safety. But not many of us are intentional enough in the thought we give to travel. We don’t take seriously the risk of idolatry. We don’t praise God for the beauty he has made in creation. We don’t give much thought to putting our home relationships or ministries on hold. We don’t see travel as an opportunity to encourage other Christians, or to witness to those who don’t yet know Christ. We don’t capitalise on the possibility of attitude reform against prejudice or narrow-mindedness through travel. We don’t weigh the force of different sinful temptations when away. We don’t approach travel as the educational experience of people/culture/belief it can be. We don’t routinely consider godly stewardship of our time and money with regards to travel. This book speaks to all these things. If you are someone who is wanting to use your whole life in the service of Jesus, and travel may at any point be a part of that life, this book is for you. Nicola lives in Perth with her husband Steve and three young children. In between changing nappies and managing childhood emotions towards positive outcomes (! ), she loves thinking and reading about God, life and people. She also loves the beach, tea and classical music.